Use 4 (four) strings of lights to wire the wreath. Each string may be up to 200 lights, e.g., 35, 50, 100, 135 (100+35), 150 (100+50), or 200 (­100+100). Make sure you coil the extra wire between two connected strings so that the last bulb of the first string and the first bulb of the second string have the same spacing as the rest of the bulbs. This will eliminate gaps in the lighting. 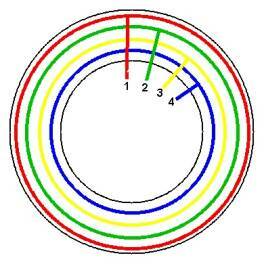 The wiring diagram in Figure 1 should be used when a color change effect or a smooth rotating effect is desired. The wiring pattern is simply a number of zigzags going around the wreath. 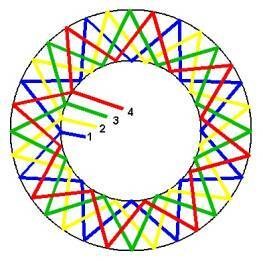 In Figure 1, 8 zigzags are shown for each of the four colored light strings. The wreath size will determine the number of lights per string and the number of zigzags per string needed to make a uniform pattern of lights. If 100 lights were used, then about three lights per leg would be used. If the light spacing was 4" per light, then a wreath 12" would be covered nicely. For a smaller wreath, say 2' in diameter, four 50 light strings could be used with 6 zigzags per revolution and using three lights per leg to cover the wreath. 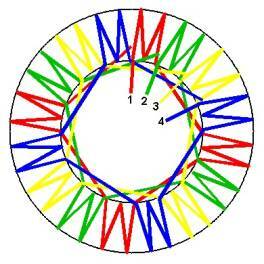 Figure 2 shows another pattern for wiring a wreath for a rotating effect. In this pattern, the wreath would appear to have four lighted segments which would rotate. The diagram shows four segments with three zigzags per segment for each color. This rotating effect is best when all clear lights are used or a single color is used for all four strings of lights. It can be done with four single colored strings like in Figure 2, however the large contrast between yellow and blue, and red and green give a pulsating effect. Figure 3 shows a third way to wire a wreath. By wiring the wreath in concentric circles, an effect can be created that makes circles appear to shrink as they move toward the center or makes them appear to expand like a bubble as they move toward the outer edge (ANIM 1 LIM). By using other patterns, The whole wreath will expand out then back in like it's breathing!! (ANIM 5 1 of 4 Oscillator or ANIM 11 Breathing) Another interesting pattern is ANIM 7 Following Cascade, lights the rings one-at-a-time then turns them of one-at-a-time. Try different modes for different effects. Have fun!!! Slow the speed down so you can see the patterns more easily. You can't harm anything so play around. When you have selected the mode (pattern), speed, and brightness you want, just let it run for a minute and it will remember the settings automatically.